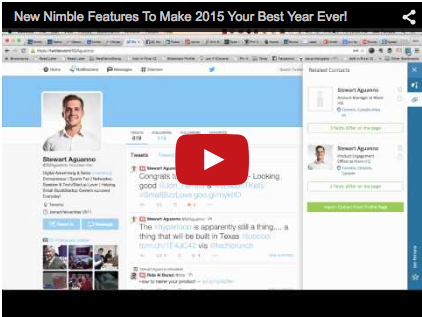 New Nimble Features To Make 2015 Your Best Year Ever! We have made a series of exciting updates to Nimble to help you kick off 2015 with a bang! Late in 2014, we released a brand new 2-Way Sync with Google Calendar and Nimble. Now you can sync multiple calendars to Nimble, and all of the information will sync between Google and Nimble. This includes all of your calendar history and scheduled events which will automatically be linked to your Nimble contacts. Simply go to your Nimble settings to setup. We made our Nimble Smart Contacts App Smart Aware of the places you work so you can easily import and update your contacts from Anywhere including; Gmail, LinkedIn, Twitter, Facebook, Salesforce, Instagram, Google+, Foursquare, AngelList, Intercom.io or any browser based app with the simple click of a button. You can also interact with contacts messages and social streams by replying to emails and engaging social content so you can connect to people on whatever channel works; Everywhere You Work. We’ve incorporated your feedback to make it easier to “Nimble” contacts with the new Nimble browser button to see rich contact insights and team communication history on anyone, anywhere, then engage and build relationships as you work in your browser. It’s Awards Season…and Nimble Is A Clear Winner! We are honored to share that Nimble was crowned winner of eight new awards in December to wrap up an amazing 2014; we are grateful for our community for the reviews which allowed us to receive these honors. We were recognized as the #1 CRM for Small Business by Technology Advice, Highest Rated Software by Small, Mid-Size and Enterprise Business Users, Highest Rated CRM, Highest Rated Sales Intelligence, Best Software 2014 and Highest Rated Ease-of-Setup by G2 Crowd, a leading source of business technology reviews. These awards follows G2 Crowd’s recent recognition as #1 CRM in Customer Satisfaction and High Performer with a 98 satisfaction score, the highest in the CRM grid. Nimble was also recognized previously as #1 Sales Intelligence in Customer Satisfaction and overall High Performer. G2 Crowd’s Customer Relationship Management Grid and Sales Intelligence Grid, are comprehensive reports on over 4,000 software vendors representing 5,000 products based on 30,000 customer reviews. Nimble has been ranked the #1 High Performer and #1 in Customer Satisfaction with 96% of users rating it 4 or 5 stars ahead of all other CRM’s including Salesforce, Microsoft CRM and Oracle CRM. Previous Nimble Wins 8 Awards – Crowned #1 and Highest Rated #CRM for Small, Mid & Enterprise Biz!